EVENT: UDAAN 2013 organized by 350 India: a global organization building grassroots movements across the country. 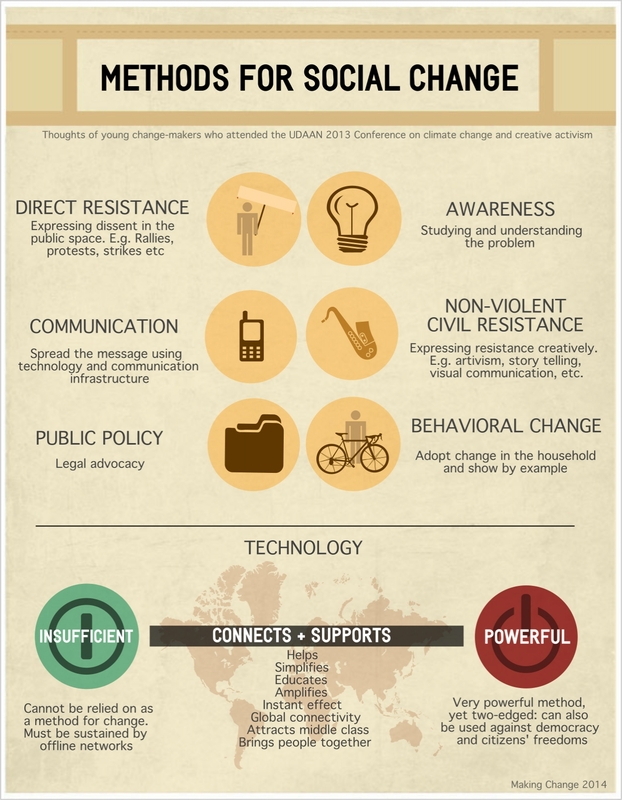 METHOD OF CHANGE: Behavioral change, solidarity networks and creative activism. This is one of the many responses we collected from UDAAN participants on what it means to make change in India today. So far, in previous articles, we have looked at organizations working with specific demographics and themes. On this opportunity, we are exploring the ideas behind a group conformed by individuals coming from different walks of life, who embody an array of historical, linguistic and cultural understandings of the world, yet still find an intersection at their intents for change. We addressed the core questions raised in the project's thought piece: Whose Change is it Anyway: “What is the understanding of change with which we were working? What are the kinds of changes being imagened? Whose change is it, anyway?” -to start touching base with the ideas underpinning their actions, and identify how -or whether- it introduces new ways to define this concept. I had the privilege of joining this inspiring group during a four day conference and got the opportunity to share with students, activists and entrepreneurs from 13 states of India (chosen from a pool of 2000 applicants) involved in social change practices across the country. Despite the diverging world views among participants, the sense of a common purpose was almost undisputed. Every attendee was committed to mitigate the detrimental impact of climate change in their cities, protect vulnerable populations and advocate for justice. However, the most interesting points of contention lied on how to translate this commitment into individual and collective action, create conditions that enable change, and encourage community participation in environmental, political and social issues. With these questions in mind, the conference focused on providing strategies of action and the attendees explored all sorts of lobbying and political participation mechanisms through its workshops. Three main elements stood out for me. First, the cocktail of tactics provided by experienced campaigners: from direct resistance and non-violent action to story-telling and street theater; participants were inspired to experiment and re-conceptualize activism. Second, the use of gamification in the workshops, facilitated by the experiential learning group Educators Collective, was the key to introduce values of leadership, solidarity and sustainability into individual behaviour and team practices. And finally, the add of 'unconference slots' to the program empowered attendees to share their methods, initiatives and projects in an open platform. This fostered peer-to-peer learning and more importantly reinforced the net of support and the immense amount of admiration (that grew exponentially between participants) for each other's work. Coming from the perspective of our research project: Making Change, it was second nature to me to question frameworks utilized around "making change". I was pleasantly surprised to find an array of perspectives and experiences floating around panels, workshops and keynote presentations. They were definitely seeking consensus, yet in a way that did not inhibit diversity of thought, intellectual curiosity and self-reflection. This sparked the idea of collecting these views and use them as a sample of the current status of youth activism in India. Particularly considering how many of the strategies taught at UDAAN, while incredibly powerful, require a set of resources (including capital, time and energy) that are not readily accessible for all aspiring activists in the country. These thoughts are consistent with a couple of articles I referred to for context on Indian youth and activism. Starting with the IRIS Knowledge Foundation and the UN-HABITAT's report: "State of the Urban Youth, India 2012: Employment, Livelihoods, Skills". It states that in only seven years, India will become the youngest country of the world with a median age of 29 years old. This, coupled with the fact that India's youth is the largest group in the working-age population — in a country that is expected to become one of the world's next major economic powers (Ilavasaran, 2013) — has, according to Padma Prakash, led demographers and economists to consider youth as the future of the country's economic growth. Having said that, these promising prospects do not reflect that 87.2% of the unemployed of the country are youth, only 27% of Indian youth is literate and 64% is located in rural areas. These facts display a constant negotiation between precariousness and hope, and particularly the high level of dissonance between the expectations and opportunities surrounding this group. Furthermore, as put by Prakash, despite the amount of economic information we have on this group, we lack a deep understanding of the social constructs underpinning their motivations and actions. On one hand, Ilavasaran suggests precariousness is the trigger behind both their unrest and their activism. On the other, the path they end up taking will depend on how they understand making change and their role within this process. This dilemma was quite evident at UDAAN. Youth from all over India came together to fervently speak about the grievances climate change is causing in their regions and share the stories behind their struggles. On this note, the conference represented an incubator for their ideas and frustrations. and one of its main goals was to steer all this energy towards a path of constructive positive change. Carpini on his work on civic engagement (2000) outlines three factors that lead to participation: motivation, opportunities and capabilities; and how the interplay of the three result in different patterns of change-making. Hence, what is left to answer is how will this chaotic ecosystem shape youth's ideas of creating change? And to what extent will these conditions determine their motivation, opportunities and capacities of participating in the process? The survey we sent out to participants is only a starting point to reflect on these points. It did not aim to resolve these questions, but instead gather a snapshot of how politically and socially active young citizens are locating change and framing some of the biggest challenges of its generation. a) Definitions: Participants were asked how they understand 'change' and 'making change'. b) Actors: Participants were asked to reflect on their role and the role of youth in the process of making change. It also touched on concepts of active citizenship and engagement. c) Methods: This section looked at the practices and methods preferred by youth for making change. Participants were asked to think about strategies and tactics discussed at the UDAAN workshops or other initiatives of interest, and how ICT/technology affect the process. The purpose was to collate as many ideas and perspectives around change-making from this group and hence, the questions were broad and open-ended. The participants remained anonymous and details about their age, religion, region, socio-economic status, etc., were not disclosed. The language barrier and access (and frequency of access) to social media platforms was a big limitation to obtain a larger sample but the responses still reflected interesting patterns, which were later classified and categorized using a keyword system. 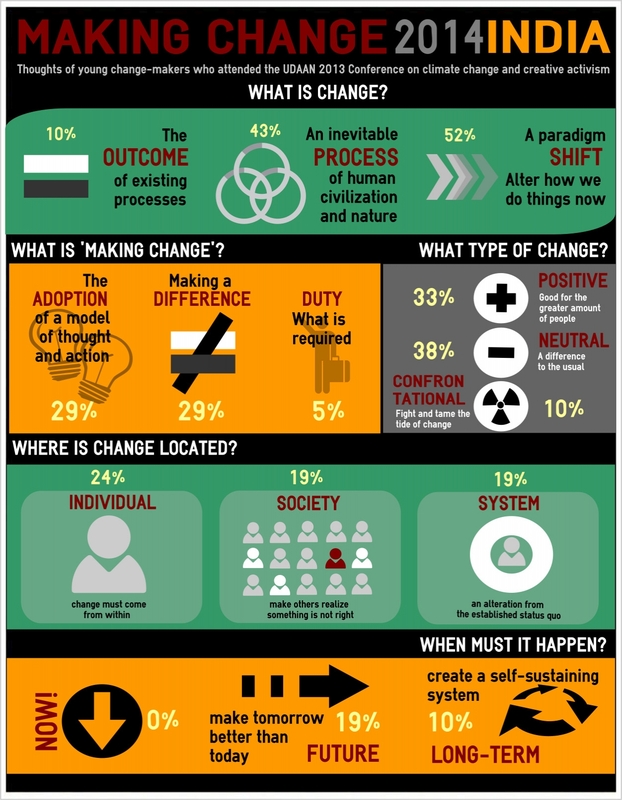 Infographic 1* reflects the different ways participants outlined change-making: definitions of 'change' and 'making change', type of change (positive, neutral or confrontational), location of change (individual, society or system) and time of change (now, future, long-term). 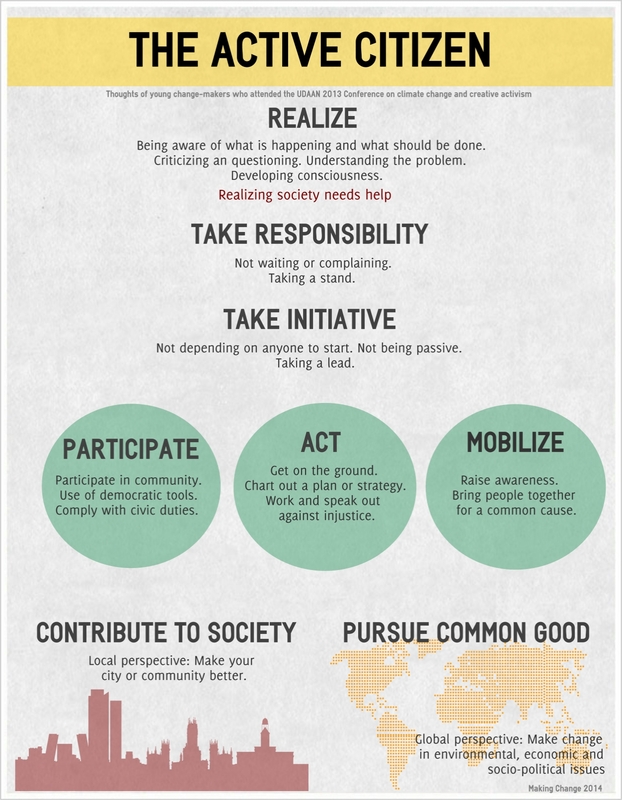 Infographics 2* and 3 outline the profiles of a change-maker and an active citizen. Infographic 4 lists their preferred methods of change -in no particular order. The bottom section reflects the spectrum of opinions around the use of technology. *The percentages reflect the portion of respondents who reflected this view and the texts are excerpts of the respondents' answers. This presentation format was chosen for three reasons: first, to facilitate the consumption of raw data collected from the survey and make visual associations between themes. Second, to put into practice some the recommendations from the storytelling workshop to make research more accessible to the public. And third, as a somewhat self-serving experiment to measure a) the ability of a graphic designer rookie, with no previous experience (like me), to create visual aids and graphics with free online tools, and b) explore empirically some of the methods I have encountered through my research: Methods for Social Change. Hence, the following results will not be of an academic nature as previous posts, but will instead clarify some of the patterns, evident in the original responses, that may have been lost in graphic translation. "Change is any alteration from an established status-quo. Making change is creating a system that is self-sustaining and capable of surviving over a long period of time"
In spite of including both concepts on the same question, most respondents differentiated them in their answers. Approximately 50% of the sample responded 'change' was either an irreversible process or an outcome to a process, while the other 50% implicated themselves in the 'change' process, stating it means to shift and modify how we act and think. A similar spirit was reflected about 'making change'. About 29% of the participants acknowledges a break from previous practices, and 29% considers we are implicated through the adoption of a new model of action. Interestingly enough, only 5% considers making change a duty or a responsibility. This low percentage signals making change is understood as non-compulsory which does not affect active politically involved citizens but leaves the more passive and idle off the hook when it comes to acknowledging their role in the process of change. Moving on to type of change: 38% of the respondents consider making change a neutral process that does not guarantee a positive change (as considered by 33% of the sample). It was defined as an event that merely breaks the norm or from usual practices. A possible reading of this is that a group is not mobilizing its efforts with a plausible positive alternative in mind. Instead, it seeks difference without a deeper considerations of how will it differ from the conditions it is breaking from. This fits into the 'politics of hope' paradigm brought up by Shah in the piece: This approach to change and the idiom 'making a difference' is "so infused with the joy of possibilities" that it doesn't evaluate whether the outcome will lead to further assurance or precariousness, when compared to the earlier structure. This approach limits structural, systemic and sustainable change, an issue that was also evident in the results of the time-line. 0% thinks change must be made immediately but the rest of the sample was divided into making plans for the future (19%) and a smaller number on securing a self-sustaining system (10%) to replace the former. Finally, on the question of where is change located, we find the first instance of a pattern that was evident throughout the survey. On this category 38% finds change must occur externally: either in society and others (19%), or through the shift from a status quo that is perpetuating inequality (19%). Yet the largest group (24%) identified that change must occur internally first. The role of the self was also very prominent in the following sections as well. After locating change, the project also intends to understand who are the main actors and stakeholders lumped into the category of 'citizen' or 'citizen action'. On this survey, these actors were dubbed 'change-makers'. Respondents were free to describe what they understood by the term and the social construct determining the model they were working towards (as aspiring change-makers themselves). The second actor we inquired about was 'active citizen'. The concept of citizenship is ambiguous terrain, yet there seems to be a connection between the identity confered by the 'citizen' status and the respondents' inner call for action. "I think that all of us can be change-makers. 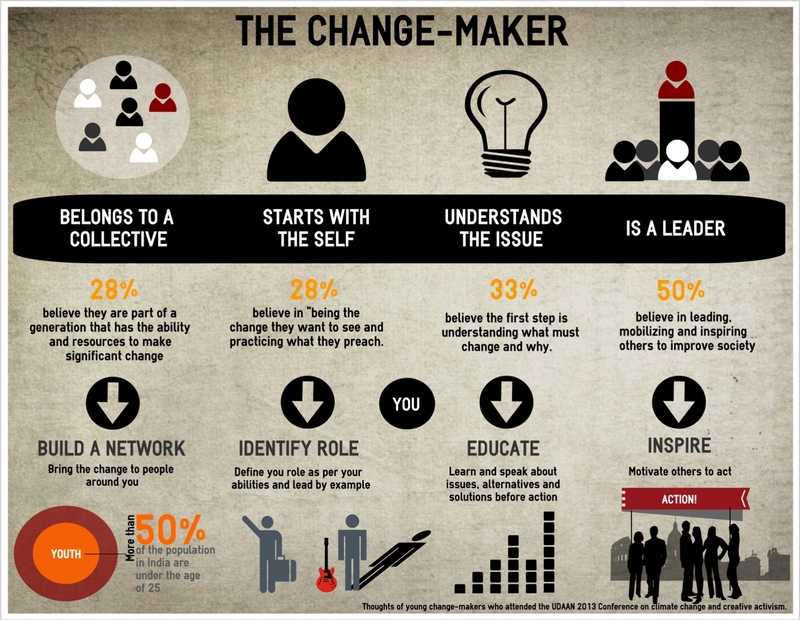 We need to be sure of what and why we need to change and have a vision of how the world will be after making the change"
The Change-Maker (Infographic 2) was defined by the four characteristics outlined below. Each characteristic was coupled by actions that reinforce this behaviour. For example, understanding the issue (33%) comes hand-in-hand with inciting motivation through information: 'If one aspires to change, then one must first understand what is to be changed, how it is to be changed and what would replace the changed system. The primary step is to realize and acknowledge the problem, educate others and then action” (Anonymous survey respondent, 2013) Another interesting example is how the 28% that identified the individual as the source of change, also recommend self-reflection on how to create the most impact: "[My role as a change-maker is] practicing what I preach and learning to critique myself constructively and in a manner that helps me improve" (Anonymous survey respondent, 2013) This brings a different light to Carpinis categorization of 'capabilities' in social change. It is no longer about participation in an external movement but more about how the individual secures sustained change through his own consistent and coherent behaviour. "An active citizen is who follows the constitution, understands and takes responsibility for himself and for influencing his family and community for the betterment of life's social, economic and environmental issues"
Self-awareness was a key point in how the active citizen was personified. It was one of most emphasized points, placing more responsibility on the role of the citizen as opposed to on the issue at hand. Attitudes such as 'realizing the problem', 'taking responsibility' and 'taking initiative' reflect that the individual is finding motivation on taking ownership of his choices and decision-making power. The individual is focusing less on antagonizing the structure and is instead elevating his identity to a fearless, noble status -the citizen is becoming the hero of its own narrative. This ego-emphasis, is also motivating the citizen to invest on increasing its own knowledge capital and attain a thorough understanding of the issues, to then heighten individual and collective awareness around them. The objective is either local -give back to its community- or normative -work towards justice and equity- but there seems to be consensus on the starting point. Finally, infographic 4 displays a mapping of the methods brought up by participants. Again, awareness and behavioural change were the most popular, placing information and the individual at the epicenter of change-making. The impact of the theater and story telling workshops on participants was also evident, on several mentions to the power of 'artivism'. In regards to communication and technology, I was surprised to find that many respondents find it insufficient. They instead recognize the need for strong offline communities making sure activism online translates into the offline realm. “[online platforms] are vital in building quick connections amongst those who feel alike towards bringing change. But eventually, all struggles for change have to be offline [...] technology could be the first step that eventually leads the path to more offline and personal connections.”(Anonymous survey respondent, 2013) : Others were wary about its power and they recognize it can be used to both help and contain the activist with the same intensity: "Technology can either blind people or give them sight. "(Anonymous survey respondent, 2013) These views reflect youth has moved on from the tech hype that pervades the digital activism discourse. The role of technology was not excluded from the conference's tactic package and the group perceives technology as a powerful complement, yet it still places a lot more emphasis on creating sustainable change through education, behaviour and offline interactions than through digital interventions. Comments at the aftermath of the event reflected participants had undergone a collective mental shift on how to create social change. We arrived looking outwards: accustomed to pointing fingers and scouting for common enemies that personify the misdoings of inequality perpetrators. Five days at Fireflies later and after UDAAN's intervention, I can safely say we left looking inwards. We are now determined to seek information and identify the most effective ways to mainstream it and make it accessible; we are impelled to reconnect with our creative and artistic selves and put them at service of communication; we are encouraged to share our personal stories and have them inspire solidarity and movement in our communities, and above all, we will continue to pursue the level of behaviour-action consistency that legitimizes our efforts at making change. The conference turned out to be a very organic experience and it provided all of us with a space to connect with ourselves and one another in a time of growing loneliness and isolation in the digital age. Furthermore, the thoughts that surfaced on the survey are important pointers to continue uncovering what drives civic engagement among youth. Seeing these activists locate change in the self was a refreshing break from the times we used to overindulge in the possibilities of technology-mediated change. It seems that the digital is already so embedded in our interactions and ecosystems that it has not only has ceased to be novel, but it is recognized as insufficent, and hence, the attention has returned back to the user and its offline communities. With this in mind, the group that attended UDAAN, as part of the demographic who represents "the promise and future of India's growth", is taking up the challenge of strengthening ideas of making change in their networks. Have them succeed, and this 'growth' will be met by a current of better informed, better armed young activists working to secure a self-sustaining system for the generations to come. Ilavarasan, P. Vigneswara. "Community work and limited online activism among India youth." International Communication Gazette 75, no. 3 (2013): 284-299. Shah, Nishant “Whose Change is it Anyways? Hivos Knowledge Program. (April 30, 2013).